There is nothing like Cinnamon and Caramel Rolls baking in the oven unless they are sitting on a plate in front of you with a slather of butter. 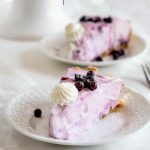 If I had the knowledge and life experiences when I was young and just starting out on my own as I have now, I would have gone to culinary school or better yet, studied to be a pastry chef at Le Cordon Bleu in Paris. Oooh la la…. 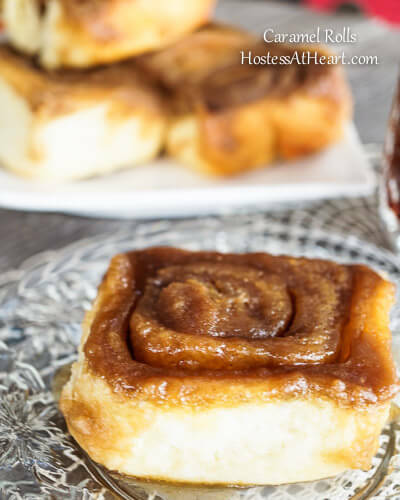 Cinnamon and Caramel Rolls would have been a regular in my kitchen school or no school. I’ve graduated my rolls by making my own sweet dough. They bake up soft and gooey. This dough is excellent for either cinnamon or caramel rolls. As you can see, these rolls are the caramel roll. You can even add chopped nuts to the caramel filling, topping or both! Go big or go home right? 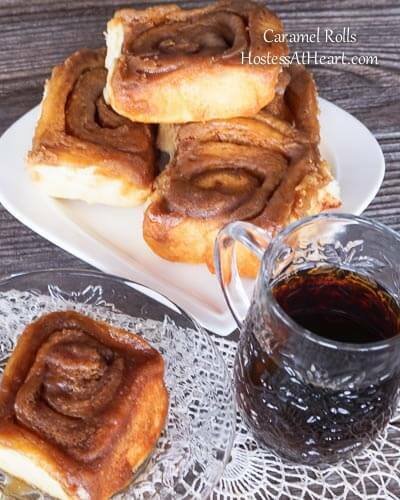 A great example of mixing up this recipe is Chocolate Malt Sweet Rolls! Dark Brown Sugar - I used close to 3 cups. You may use more or less. In a sauce pan, heat milk to 180 degrees F. Add sugar and shortening and continue heating until shortening is melted. Allow to cool slightly. Over heating will kill the yeast and prevent your dough from rising. In a large mixing bowl, combine only 4 cups of the bread flour and remaining dough ingredients. Combine with warm milk mixture. Mix well. Add 4 eggs, one at a time, mixing well after each addition. Add additional flour one cup at a time until dough is sticky but manageable (additional 4-5 cups). You don't want it dry and tough. Cover and allow dough to rise in a warm non-drafty area 1 to 1-1/2 hours. Punch down and allow to rise again. On a floured surface, roll dough out until 12 to 14 inches wide and 3 feet long and 1/2 inch thick. Brush with melted butter and sprinkle on brown sugar and cinnamon, cover dough completely. Roll dough evenly and slightly tight toward you. Cut into 1/2 inch rolls with a sharp knife or dental floss. Cinnamon rolls - grease baking pan. I used 3 9x13 pans, 12 rolls per pan. Allow rolls to rise another 30 minutes in the baking pans. 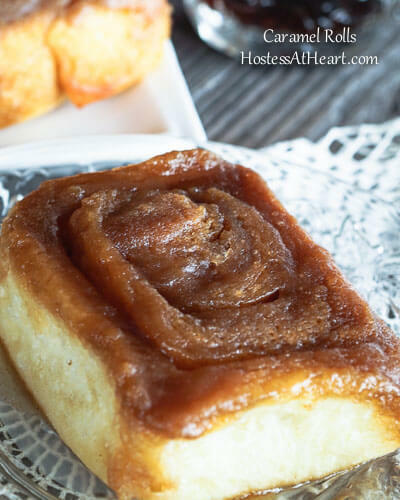 Caramel rolls - Melt caramel ingredients together in a medium sized sauce pan. Pour caramel into the bottom of baking pans. Fill with 12 rolls per 9 x 13 pan. Allow rolls to rise another 30 minutes in the baking pans. Bake at 350 degrees F for 20 minutes. Remove pan from oven and allow to cool for 5 minutes. 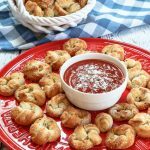 Turn rolls out of their pan onto a piece of tin foil or serving platter. Spoon any remaining caramel over rolls or frost Cinnamon rolls once cool. Store in airtight container for up to a week, or place in the freezer for up to 3 months. One word of caution about these rolls is that once you share, people aren’t shy about putting in their orders for future rolls. This recipe isn’t difficult, and it makes up to 40 good sized rolls. Enough to share or put in the freezer for another day. These look delicious Julie! 🙂 Love cinnamon buns and I need to try this recipe! Thank you skd! It’s hard not eating them right out of the pan but that hot caramel would do a number on my mouth. 🙂 Have a great weekend! They look absolutely amazing, sweet as I like and delicious. Continue to follow your passion for cooking, Julie 🙂 Enjoy your weekend! Thank you very much! It is a passion of mine. It took me long enough to learn that. Enjoy your weekend as well! Julie, I’m addicted to these! 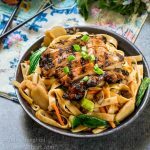 I will give your recipe a try…love your photos too! Thank you so much! You’ve sure been putting out some gorgeous recipes that I can’t wait to try on twitter too! I love these rolls Julie. I grew up very artistic too. Drawing, sketching, painting, dancing, all the way. Bookmarking these to make :). Thank you Sonal! I think cooking is another art so am not surprised that you enjoy other types as well. Your blog shows your artistic talent. It’s a good thing I don’t have your address! These are beautiful, and I’ll bet they are wonderful. I’m glad you’ve found something you enjoy so much. Patti, I’d bake up a couple if you find yourself on my front porch! Thank you for your comments! Looks gorgeous! Drool worthy texture and colour, Julie…so irresistible! And, I can imagine the smell! Ah, I have to taste one right away! Thank you so much! They are so delicious. I haven’t met anyone that dislikes them yet. Thank you! I would gladly share. Please don’t tell me you’ve baked these the past week or two Julie? They look absolutely amazing, and oddly enough, I can smell the cinnamon and sugar :). I’ll definitely have to bake these when my daughters come home, they both love cinnamon rolls. I have taken a leaf out of your book and will start challenging myself to make things I’m not familiar with. I’ll start with making bread, any good recipes from scratch that you could share? How are you healing Julie? I hope you continue to be stronger, have you started PT yet? Thank you my dear friend. I actually made these the weekend before my surgery and gifted them to friends and family. Of course I left a few at home too. I am doing well. I went to the Dr. yesterday and have another 5 weeks before I can even start rehab. I am getting some reading done in the meantime and feeling better all the time. I have two breads on my site for you to pick from. One is a “No-knead” bread and the other one is the “English Muffin” bread. Both are very good and not difficult. So glad you are slowly but surely on the mend Julie. It’s actually a good time to heal and mend in this weather isn’t it? Imagine if it were July, you’d be anxious to get out and about. Thanks for the recommendations. I did take a look at them. I do not have a heavy cast iron pot, so the no-knead bread will be the one. I want to halve the recipe, and make it with wholewheat flour, just as a test. Will let you know how it turns out. Thanks a bunch! You are right Loretta, I wold go stir crazy if it was July. I am sure the bread will turn out great! Let me know what you think. Thank you! I’m with you about the people who say they can’t cook, anybody can cook if they put their mind to it! Of course, not everybody wants to which is fine! I remember the first time I made cinnamon rolls from scratch, I felt like I could conquer the world haha! Both versions of these sound delicious! Oh yea and the accolades made sure that I made them again! Thank you Lili! They are very good. Not hard just takes a bit of time. They look delicious. Granddaughters visiting for a week during spring break. Though I am not known for baking, I will give this recipe a try. Thank you fro sharing. Put her to work helping you. I think she would enjoy baking with you. I sure have fond memories of helping my grandmother in the kitchen even though I probably wasn’t much help. Thank you so much for your kind compliments. They are very good. Not heavy like some dough but strong enough that they hold on to your filing. I hope you will let me know what you think if you make them. I seem to make caramel rolls more than cinnamon. That goo keeps them fresh and they heat up so well. I eat Yogurt with granola most mornings or oatmeal. Julie, these look wonderful! I am amazed that you let these rolls roll out the door at all, but I know they made a wonderful and thoughtful gift. I also glad to hear that you’re healing well! It’s great to read about you and your background, too! LOL Thanks Jess! Happy FF to you too! These cinnamon and caramel rolls look to die for!!! Yum!! Thank you so much! We really enjoy them as that once in a while guilty pleasure! Hi Julie, your caramel rolls look delicious. 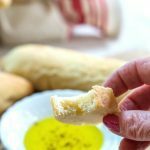 Do you know if I can use butter instead of the shortening for the dough part of the recipe? I don’t know, I have never done this but thought about it too. The dough is so light and fine without being delicate to work with. I thought the shortening might be the reason why? If you try it, let me know how it comes out. Thank you! Thanks Julie, I will for sure. Oh my goodness- they look adorable and flavorsome. I love cinnamon, and cinnamon rolls are the best. Your recipe sounds so delicious, this will be the first time I try to make my own cinnamon rolls. Hope they will turn out as perfect as yours. Thank you Cecilia! They aren’t too difficult. Just make sure that the liquid isn’t overly hot when you mix it with the dry ingredients. I did that the second time I made them and they never rose. I had to trash it and start over again. Thank you! One of the girlfriend that I gifted with a dozen said that they tasted just like the ones her mother made. I’m with you on the commercial ones. First bite yum, second not so much! Oh my …these look so wonderfully delicious! 🙂 They remind me of the ones my mom used to make from scratch. I have never tried to make cinnamon rolls like this. This recipe looks really pretty easy …saving this one! It is an easy one Arl. It takes a bit because they rise twice but on a cold day they are fun to make. I shared these with a friend that said they tasted just like the ones her mother used to make. Thank you Elaine! I am doing well, and will look forward to getting back into the kitchen. Thank you Suzanne. They are a favorite of ours. A guilty pleasure that is. Thank you Dawn! I love knocking around the kitchen! I have to try these caramel rolls. They look delish! I hope you are feeling better, Julie. Are you back in the kitchen…? No I made these right before my surgery and gave them away as thank you gifts to some of the folks that had been so helpful! I am better but it will be a slow go I think. If you make these rolls, make sure your son is home so he can help you eat them. It makes quite a few. Thanks Ana for checking in! Julie I so want one of these right now with my coffee…Please!! LOL 🙂 Love it!! Amy, I would gladly brew you a cup and remove a couple for us from the freezer! Thank you and have a wonderful day! Thank you! Ooey gooey yummy.